Tactical Drawings does great work. Artist Joonho ‘JK’ Kim is from Seoul, South Korea. He was in the ROK Army before coming to the US. Since 2004 he has been a part of the chaplain program at the Pima Count Sheriff’s Department and in 2005 he became the Pima County Regional SWAT chaplain. He also teaches edged weapon fighting to local LEOs, military personnel and contractors. In addition to being a talented artist (a great understatement) he is a genuinely nice and self-effacing man. Check out his website. 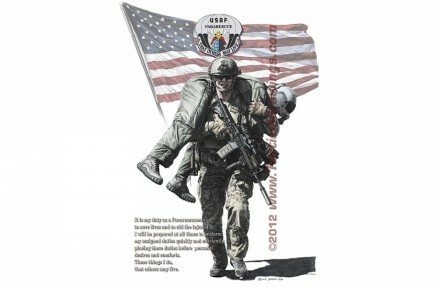 About the PJ artwork he says, “I hope that my drawing properly depicted their courage, dedication, brotherhood, and loyalty. They truly live up to their creed: That others may live.” You can buy the print here.